On Tuesday we will see a major sporting event kick off in Ohio, with hundreds of thousands (if not millions) of people watching online. No, it’s not MLB opening day or the Columbus Crew (but has a soccer fan, I would love to see a crowd of that size for a domestic game). No, I’m talking about the first ever Valve-sponsored Major for Counter-Strike:Global Offensive here in the United States, Major League Gaming’s Championship: Columbus. While not the first Major, it’s the first one held in the States — all previous Majors have been held in Europe. The location isn’t the only notable change to the Major, as this also represents a record of four teams from the North American region qualifying, though a team from Europe — in particular, Fnatic — seem likely to take the championship. In addition to the solid North American representation in Columbus, Brazil is represented in team Luminosity Gaming, and if any team could challenge the EU region heavyweights, it might be LG. On top of the diverse lineup, the prize pool has been quadrupled from a notable $250,000 in previous Majors to an impressive $1,000,000 up for grabs, with $500,000 going to the first place team. Beyond the massive increase in the cash, Valve has also made changes to the gameplay, specifically the clock, and it is something that could play a role — for better or worse — in the upcoming matches. While that’s the quick and dirty comparison, Valve — developers and sponsors of this Major — have decided to toy with what effectively is the “shot clock” in CS:GO. For years and years, heck, even since I played Counter-Strike 1.5 and 1.6, the universal standard* for each individual round was 1:45, or if the bomb was planted, a 35 second timer would begin. Last December, Valve implemented a significant change, shifting to the longer, previously mentioned 1:55 round and increasing the bomb detonation timer from 35 to 40 seconds. The key thing is that neither planting the bomb nor defusing is instantaneous. It takes approximately three seconds for the T side to plant the bomb, and for the CT side, defusing it varies based on whether or not the CT purchases a defuse kit. Without the kit, it’s a full 10-second defuse but with the kit it’s cut in half to five seconds. *Valve had a 45-second bomb timer in their official matchmaking until the December change, however this article is aiming to address competitive play. While leagues such as ESL/ESEA Pro League have adopted the longer round time and 40-second bomb detonation time as have DreamHack tournaments, the change could absolutely affect rounds and thus matches. For example, imagine if the NBA changed a similar 10-percent increase in the shot clock, rather than 24 seconds it would get bumped to 26.4 seconds. Or overall game length from four 12-minute quarters to four 13:15 quarters. It isn’t hard to see just how drastically this would change things like player substitutions, shot selection, timeout usage and team fouls. Just like basketball, CS:GO is heavily reliant on the clock to force action. By changing what forces the action, I would argue the game has been changed as well. Rather than worry about player substitutions or shot selection like in basketball, the thing being juggled — especially on the CT side of things — in CS:GO is the in-game economy. Instead of needing to purchase a defuse kit, now the CTs can opt to spend that cash elsewhere, be it an upgraded weapon, grenade, body armor etc., and still have what almost equals the same amount of time. By choosing to not purchase a kit, there is no real difference between a full 10-second defuse on the 40-second bomb timer versus buying a kit to cut the time in half to five seconds on a 35-second timer. The kit itself a relatively small price to pay, just $400 in-game dollars, yet that same amount of currency is the same as two flash bangs, one smoke or one high explosive grenade (with $100 left over). As one would suspect, this type of equipment can absolutely have a huge affect on how a round plays out as the longer bomb time opens up the CT arsenal considerably. On top of the in-game currency falling under scrutiny, the million dollar prize pool is something to cover in detail as well. To be honest, the $1 million is technically correct for the tournament itself, but it fails to account for one thing: stickers. No, not actual, real life stickers, instead these stickers allow the purchaser to place the stickers on weapons if they so desire. 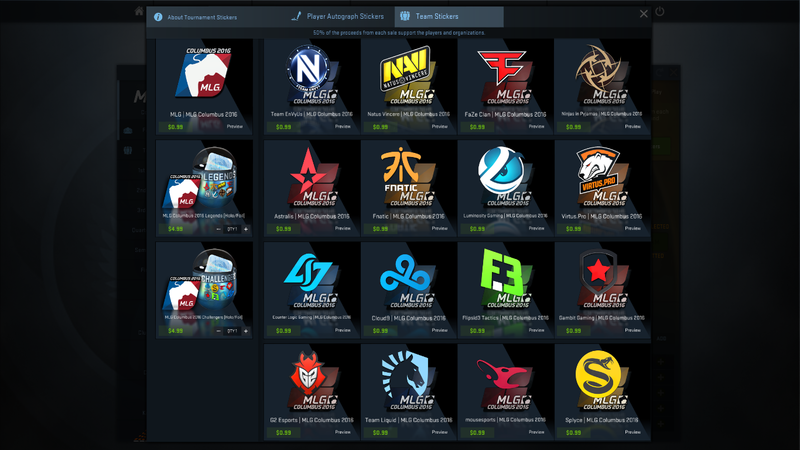 The stickers cost just $0.99 with the money being split 50/50, half going to Valve and the other half to the teams. 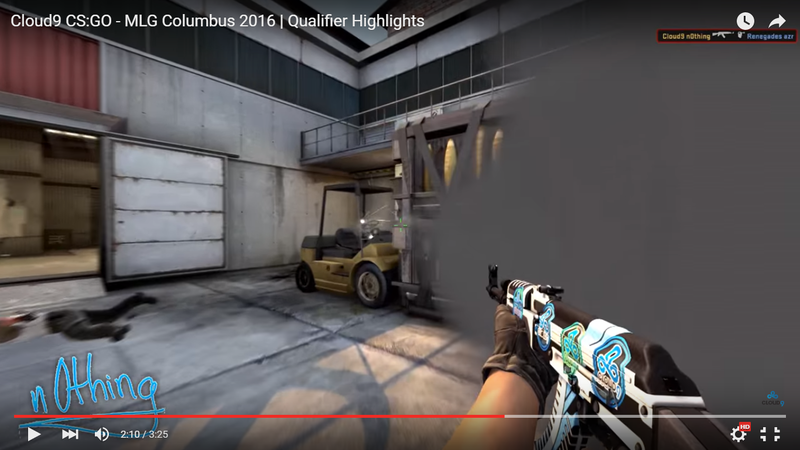 For a glimpse of an older Cloud9 sticker, here is a screenshot of C9’s Jordan “n0thing” Gilbert in action in the MLG Columbus Qualifiers. The full highlight video can be found on Cloud9’s YouTube page. Count on yours truly among those watching the streams as 16 teams representing 18 countries decide who will take home the title. The baseball playoffs have been narrowed to four teams, the number of undefeated college football teams continues to shrink every week and of course, this past week’s news cycle was filled with no shortage of information and rulings in the Daily Fantasy Sports market. Here are the stories we found interesting this week. Soccer star Thierry Henry will be speaking at TechCrunch’s Disrupt London Conference. The all-time goal scoring leader at Arsenal as well as for the French National team, Henry’s long career has allowed him to see the development and growth of sports as technology allows. The event will be held December 7 and 8 and Henry, among other guests, will be speaking at the Copper Box Arena. Many advanced technology has unlocked in the athletic world has come to benefit the players in the form of improved safety measures. One player, former Seattle Seahawk Michael Robinson, is helping develop a smart mouthpiece. Robinson is teaming up with SMRT Mouth to develop a biometric device to monitor a player’s hydration, respiration and perspiration levels. The former fullback still recalls losing one of his best friends to heat stroke back in high school, and is now setting out to prevent another tragic loss of life. From concussions to exhaustion and heat stroke, seeing former players step up to help current and future generations is grand. As YouTube continues to wade into the live-streaming market of esports, they appear to be taking a cue or two from current industry leader Twitch.tv. YouTube recently launched their “$3.99 Sponsorship” option for streamers, identical in all but name and price to Twitch’s “$4.99 Subscription” option, where the respective amount is sent from the sponsor or subscriber to the streamer. More esports investors are flocking to the digital realm as ESL, probably the largest Western esports organization, announced a multi-faceted partnership with data service provider Sportradar. ESL will give exclusive data to Sportradar, who will in turn provide analytics as well as fraud detection. With so much money — both hard currency and in-game items — on the line, match fixing is an issue in esports the same as it is in traditional sports. While tracking digital property from esports is certainly a concern, so is the digital property of various sports leagues. Recently Deadspin’s Twitter account, along with Sports Blog Nation’s, was temporarily shut down due to a DMCA notice from the NFL. Deadspin and SBN were suspended from Twitter for a handful of hours. Those sites, like many other sites and people, use GIFS (or more accurately GIFV or HTML5 videos) to help convey points, show impressive plays or just have, you know, fun. Hopefully this week’s TechGraphs News Roundup went well as I stepped in for it. I’d like to think it went better than Josh Lyman’s press briefing from The West Wing. Much like Futurama’s Lrrr (ruler of the planet Omicron Persei 8) in the episode When Aliens Attack, many are getting upset at their current television situation. At this point it isn’t just the millennial crowd versus traditional TV package customers. Certain companies who have helped bring cord cutting to the forefront of people’s minds are now splintering. Recently Amazon, creators of the Fire Stick and Fire TV, announced they will no longer sell Google’s Chromecast or Apple’s AppleTV. Via Bloomberg, Amazon has not offered new listings for said devices nor will the online retailer continue sales of the Google or Apple products after October 29th. As the linked article notes, it is curious to see Roku among other stream devices, unaffected by these events. Both Google and Apple still have various options for purchasing in stores or online, but seeing the the streaming options battle each other rather than the likes of Comcast, Charter and AT&T et al is disappointing. For now, the table below is as up-to-date as possible, though again, any Amazon price listed for Chromecast or AppleTV is a deal with an October 29 expiration date. 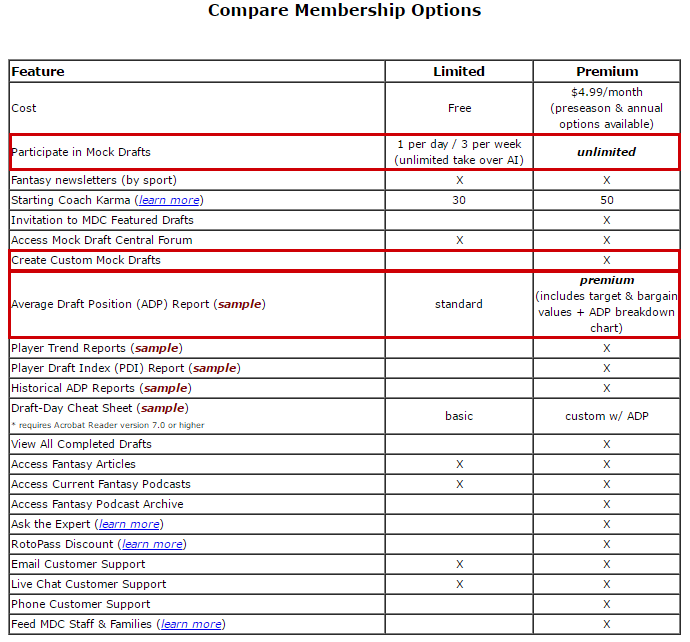 I’ve also separated the table to separate apps based on cost, determined by whether they are a monthly recurring cost, one-time payment, free, or needing a cable subscription. We here at TechGraphs are pretty big fans of Streamable — one of the latest, and in my opinion best ways of sharing media clips, and they’ve just given us a reason to like them even more. Yesterday the company unrolled a new feature for Google Chrome users, an extension that allows users to clip video (and audio if so desired) directly from YouTube as well as Twitch.tv, and a number of smaller sites. Being able to grab media files directly from Twitch.tv via a Chrome extension isn’t a particularly new option as Oddshot.tv has specialized in that area for months now, however support for web sites other than the esports-streaming site is a welcome sight. Unfortunately traditional sports sites haven’t caught on just yet — which should not surprise — however I’m looking forward to being able to grab a plate appearance or pitch sequence, or perhaps an incredible soccer cross and goal in near real-time. The maximum length of the clip is 60 seconds, which is mostly enough time to capture whatever in-game moment you’re attempting to save. For the walk-through, I’ve grabbed a clip of my beloved A’s winning their 20th consecutive game, courtesy of MLB’s YouTube Channel. Before getting too far of ourselves, make sure to install the extension. It’s available for free at the Chrome Web Store and can be found by clicking here. Once you’ve got it installed, make sure to see the Streamable icon/the infinity symbol. 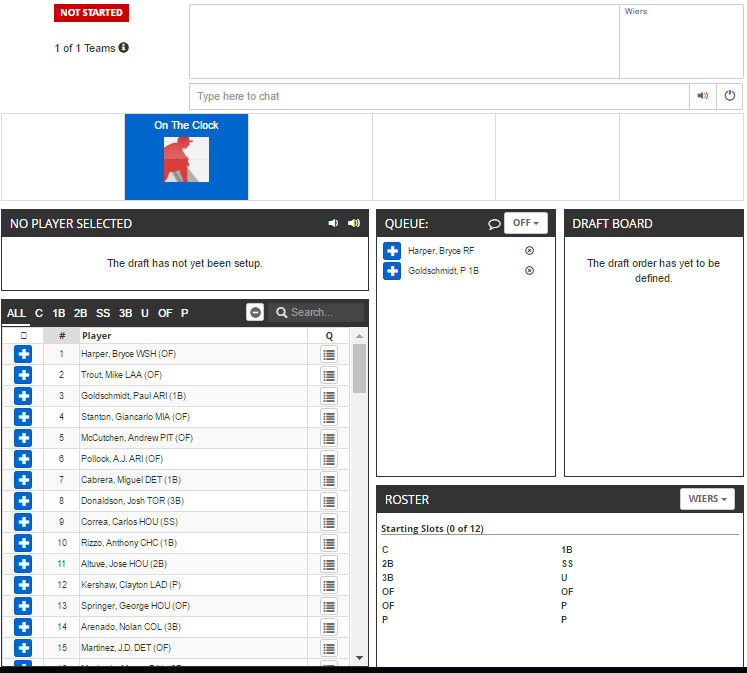 It will pop up on any page that is compatible with the extension, in this case the MLB channel. Now, after finding the clip you want — say, the glory days of seasons past — simply click on the Streamable icon and you’ll open a new page, specifically the editing page for Streamable. The extension allows users to re-name the clip (YouTube vids retain their name, but you can change it), crop, adjust the speed (as slow as x.50 or s fast as x2 with .25 increments) and to nail down a specific clip to one-tenth of a second of accuracy. Note the picture below, at first glance it seems like I’m just ripping the clip, but I’ve cropped the black bars out of the original YouTube video and I’ve typed in exactly where in the video I want the clip to begin and end. Once the clip is finished, you’re given the direct URL or you can use an HTML embed code to share. Within the embed code options you can mute the clip, something I prefer doing because loud (not to mention auto-playing) clips are pretty terrible if you’re not expecting it. Don’t worry, muting the clip within the embed code doesn’t lose the audio. It’s just like a Vine or Instagram video where you can tap the speaker icon for the sound and full experience. Grab the extension and play around with it. You’ll be sharing priceless moments in non-terrible formats in no time. DraftKings, the daily fantasy site that has saturated the TV airwaves with commercials lately, has just launched their newest wing: esports. As of right now their esports division consists solely of League of Legends matches, however I wouldn’t be surprised to see Counter-Strike: Global Offensive, Dota 2 and more titles added. 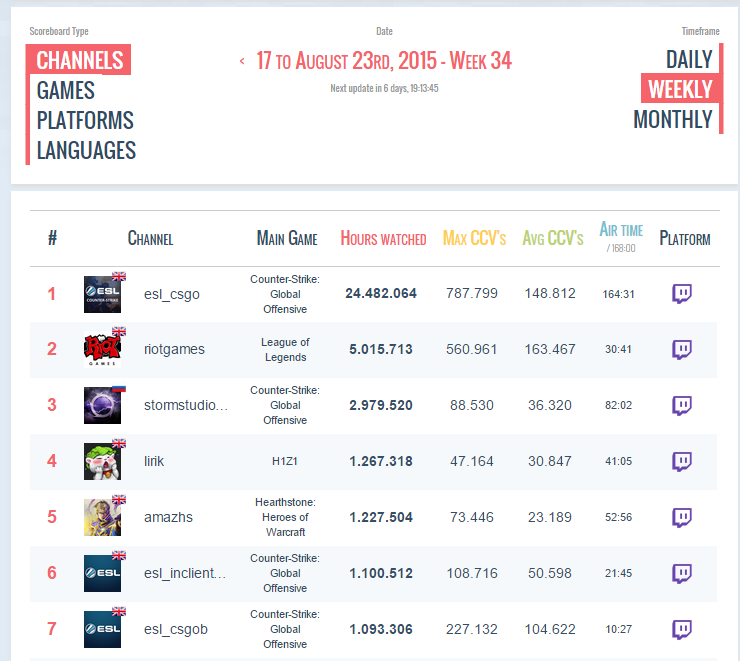 It should come as no surprise to see those three games be the most watched of August for Twitch.tv. 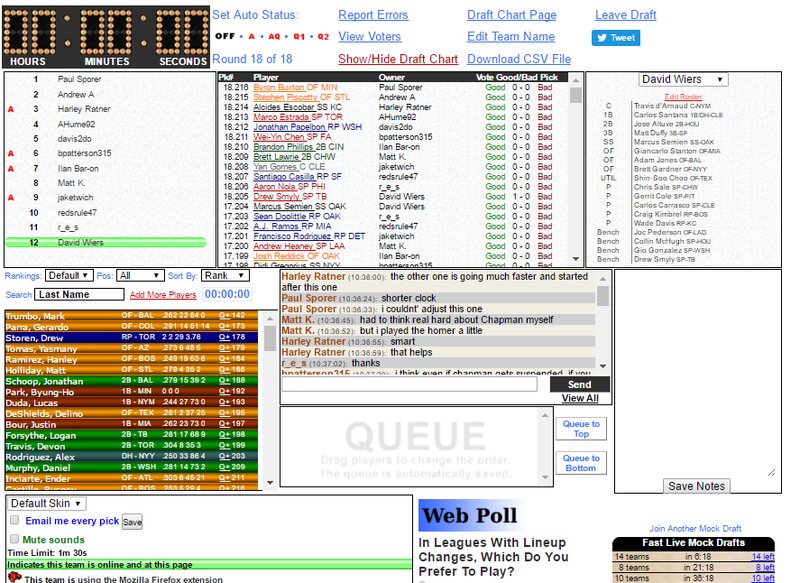 DraftKings isn’t considered gambling, but more of a skill game — though Arizona, Iowa, Louisiana, Montana and Washington consider it online gambling and prevent their residents from playing it — and esports, the same as in in the traditional athletic world is unfortunately no stranger to gambling and match fixing. From bans in CS:GO due to match fixing last year to StarCraft banning numerous player in 2010 due to a network of match throwers, sadly once money gets involved, people tend to have their morals become a bit more flexible. While DK may or may not be considered gambling, they are just the latest website to offer payouts based on investments. Ranging from websites such as CSGO Lounge to CSGO Loot, Gosu Gamers and plenty more, there is money to be made — or lost — by wagering your weapon or player “skins” depending on the game. They’re nothing more than digital pixels, but they carry real world monetary value, sometimes in excess of the tens of thousands of dollars. In the Counter-Strike realm, the sponsoring of so-called gambling sites — not DraftKings, but the others — has been banned in ESEA, a top competitive league. Citing a conflict of interest, insider knowledge and general professionalism, ESEA is making a stand against gambling. Of all the leagues to take the moral high ground on an issue, it’s interesting that ESEA does it, given their shady history. Regardless of previous transgressions, it is likely for the best to see gambling sites being barred from team sponsorship. An entirely different issue is when people under age-21 wager their skins. These items are worth lots of money, just look at some screencaps from Steam’s Community Market page. Steam is the software distribution portion of Valve, creators of CS:GO and Dota 2. Some of the items for sale on the Valve Community Market are going for $400 dollars, while other third party marketplaces are trading and betting items worth much more money than that. While this is certainly an exciting time to be an esports fan — the prize pools have never been bigger, corporate sponsorships are flowing in and possibly a major television league and broadcast deal in the works — seeing as DraftKings sees League of Legends on par with traditional sports, we can’t get too far ahead of ourselves. We’ve already seen entire organizations get taken down for throwing matches, some for cheating and with yet another website now offering to exchange cash (not just weapon skins with value tied to them) based on esports results, the cynic in me fears the worst. I personally believe the old saying “all roads lead to Rome” tends to embody “different means to the same end” and in the case of online streaming versus traditional cable subscriptions, money as always, is the bottom line. In regards to the streaming cash flow, once again Rome — okay, all of Italy — is front and center in accomplishing the end of collecting revenue, this time by means of streaming. Today the top league of Italian soccer, Serie A, announced a service that beginning on Saturday, will stream three fixtures per weekend. The price for viewing access is €3.99 for the weekend or €2.00 per individual match. In addition to the games themselves, each will have both pre- and post-game shows for analysis and news for the matches and around the league. It’s a huge move away from the old school television broadcasts, and for here in the United States, where beIN Sports holds the broadcasting rights. Serie A is the first major European league to offer a service of this kind and this could bring about a huge boost to their fandom abroad. 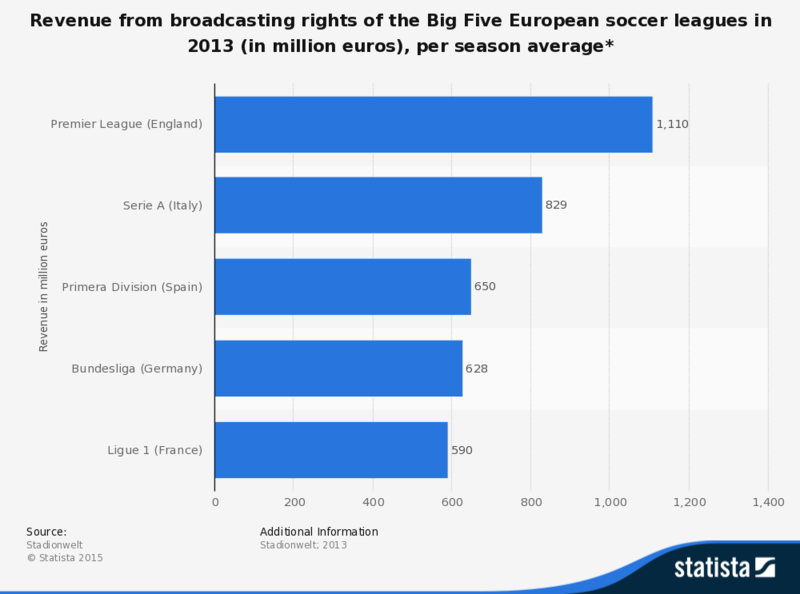 Via Statista, as of 2013, Serie A held the second highest broadcast revenue, trailing only the English Premier League. An argument could be made that Italy’s top league isn’t the powerhouse it once was, however the league has posted solid results in UEFA Champions League play, the top continental league in Europe. Even after Serie A lost one of their bids to Germany’s Bundesliga following the 2011-12 season, they’ve posted respectable results. Since being limited to three teams receiving bids to the Champions League, Italian powerhouse Juventus has managed a runner-up finish in the CL last year and both Roma and Milan have made appearances in the Group Stage of the tournament as well. 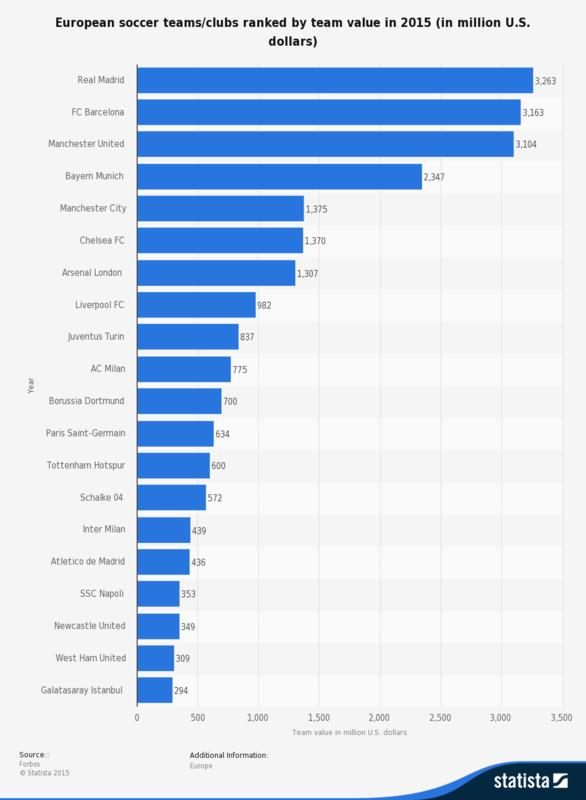 Even with four teams (Juventus, AC Milan, Inter and Napoli) in the top-20 most valuable soccer clubs as of 2015, Serie A has some catching up to do if they’d like to match the brand value of the titans of European soccer. If this streaming agreement opens up the first of many more casual soccer fans here in the US, all the better. The individual game price is well worth testing the waters of Serie A, but the model of online viewing is the most important part. If other leagues — namely the Premier League, Bundesliga or Ligue One — are able to find a way to offer streamed soccer, it will be another huge win, much like Fox Soccer 2 Go, for cord-cutting soccer fans. With the NFL season kicking off tomorrow, MLB in the middle of the playoff hunt, and of course college football and other sports already going on, it’s time to kick off a monthly series highlighting some of the best cost efficient ways of catching sports broadcasts and more. From set-top boxes to HDMI dongles to consoles, count on seeing an updated list here at TechGraphs every month. As more and more devices and channels are released, count on this list changing, especially as we approach the holiday season. It feels weird saying “holiday season” in September, but some of my local stores are already posting Black Friday store hours. There is no shortage of options available, but I’ll be limiting the list by two criteria: they have to be available in the United States, and there has to be separate hardware involved (I’m looking at you, SlingTV, Pluto and Plex). I’ve also specifically chosen Google’s Nexus Player, though there are many more other Android TV boxes. Some streaming options such as WatchESPN, HBO Go and NBC Sports Live Extra require a cable subscription, however all devices can be more than adequate for those looking to cut the cord. Given the rising demand of streaming, particularly among Millenials, all of these devices can play in a role in fulfilling your entertainment needs, be it sports or other stream options. Also of note, the Amazon Fire TV is currently off of the market apparently due to selling the entirety of the stock. There is speculation it could be relaunched in a 4K resolution shortly. With the national mean cable bill at nearly $100 per month according to Leitchman Research Group, up 39 percent from 2010. The soaring recurring costs of TV make one-time payments for top boxes and streaming services such as MLBtv or NBA League Pass more and more enticing. Between my MLBtv and Fox Soccer 2 Go via Chromecast (plus Netflix and Amazon Prime), I’m personally spending less than the near $1,200 per year that I might with cable. I’m admittedly in the minority as a cord cutter, but our numbers are rising, and for good and simple reason. It makes sense. YouTube Gaming launched last Wednesday and after nearly a week of observations, the Google powered streaming service has left several big impressions. Before fully diving into the details, it should be noted that YTG represents the first real challenger (sorry, Major League Gaming TV) to the currently undisputed streaming service of Twitch.TV. Last year Amazon purchased Twitch after Google reportedly backed out despite tentatively agreeing to a price tag upwards of $1 billion. Amazon ended up paying approximately $970 million to acquire Twitch, representing an investment — and presumably a belief — in the continued success of streaming esports and video games. Other than huge difference in viewership numbers, something not particularly unexpected given YTG is still in its infancy, there are some differences in the layout and execution of the two platforms. For the duration of this look-in, YTG will be on the left-hand side with Twitch being on the right. Pictured below is the same moment (as close as I could get) in a StarCraft II: Legacy of the Void beta game between two pairs of professional players that has been paused. The screenshot was a VOD (Video On Demand) rather than live as I couldn’t quite grab the right timing during each live broadcast. The match up took place at Red Bull Battlegrounds, something YTG labels in the upper left whereas Twitch does not during a full screen pause. It isn’t a deal making feature for YouTube, however it is a nice feature that normal YouTube videos have that has carried over to the streaming side of things. Another big chip in YTG’s favor is their pausing the VODs. YouTube grants the ability to navigate away from a specific spot in a video and being able to hit the back button and go right to where the video was paused. Twitch on the other will send you back to the beginning of the VOD rather than save a spot. For anyone who’s ever played a video game for more than a few minutes, misclicks or the wrong hotkey being hit are bound to happen, so this pause-and-return feature is another great feature from standard YouTube. The game search options for both options each leave much to be desired as both sport autocomplete options, but neither are particularly great. After clicking the game, in this case Counter-Strike: Global Offensive, Twitch welcomes you to a page featuring the top streams rated by current viewership sortable by specific maps. This is a big contrast from the generic YouTube landing page where it shows a video from a year ago as its top result and zero live streams. 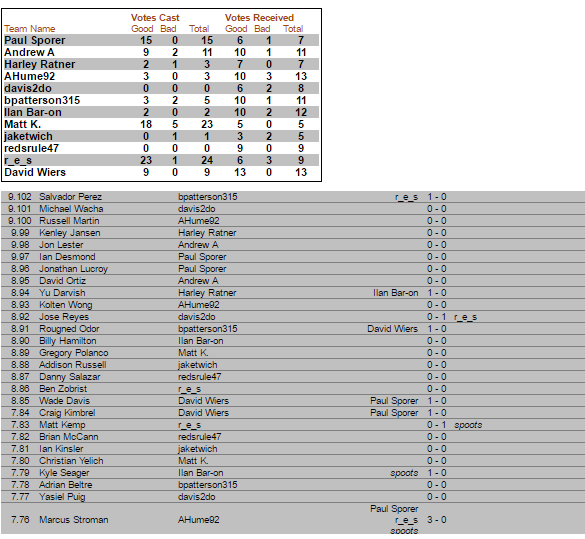 After browsing the various YTG videos, most turned out to be previously uploaded videos rather than live stream VODs. As it gains a more extensive VOD library I expect this to change, but it’s somewhat surprising to see two of the top six YTG search results be from more than four months ago. Another issue I routinely saw with YouTube that I’m willing to chalk up to it still being new is the lack of moderators for the stream chats. Of the two dozen or so YTG streams I was in, the chat was running rampant with a mix of memes, ASCII characters and the like. Obviously Twitch chat is nothing to brag about, but at least a majority of the ridiculous fluff was removed by mods in the Twitch channels I frequent. To be honest, my friends have nicknamed Twitch chat — and by extension most stream chats — as YouTube comments in real time, something that is not a compliment to anyone who has delved into the depths of said comments. Despite the flaws, I remain optimistic YouTube Gaming will get up to speed and soon give Twitch a real live streaming threat in the esports realm. As someone who has dealt with streaming issues since Justin.TV and an esports fan who grows weary of Twitch issues — specifically video stuttering or freezing and frame-rate drops despite a strong internet connection and computer — hopefully the competition YTG brings to the table will bring out the best in themselves and in Twitch, resulting in the best possible outcomes for the users. While I remain unimpressed with YouTube Gaming at the moment, I’m eager to see what the coming months brings for their viewer options. I can’t see this becoming Google Glass or Google+; this is one project that seems incredibly likely to succeed if for no other reason than that the market and demand is already in place. Over the past weekend we saw two titans of esports, League of Legends and Counter-Strike: Global Offensive, hold major tournaments. On Sunday the European and North American League of Legends Championship Series summer finals concluded with the Counter-Logic Gaming team taking first place for North America, $50,000 in prize money, and a ticket directly into the 2015 World Championship, and Fnatic taking home the trophy for Europe. Fans of CS:GO were entertained from Thursday to Sunday with the ESL One: Cologne tournament, a tournament partially sponsored by CS:GO developer Valve, with $100,000 going to the winning team and $250,000 overall up for grabs. The weekend was filled with teams from all over the world aiming to take the top prize. Both esports events captured a huge number of fans, and CS:GO set a sixth month high for Twitch.tv view hours in a single day. Via Gamoloco, CS:GO averaged more than seven million hours per day across the for the four day event, peaking at 8.9 million view hours on Saturday. It should be noted the number of hours is likely skewed by users logging in with multiple CS:GO accounts in order to raise their chances to receive a free in-game item drop, so these numbers should be taken with a grain of salt. 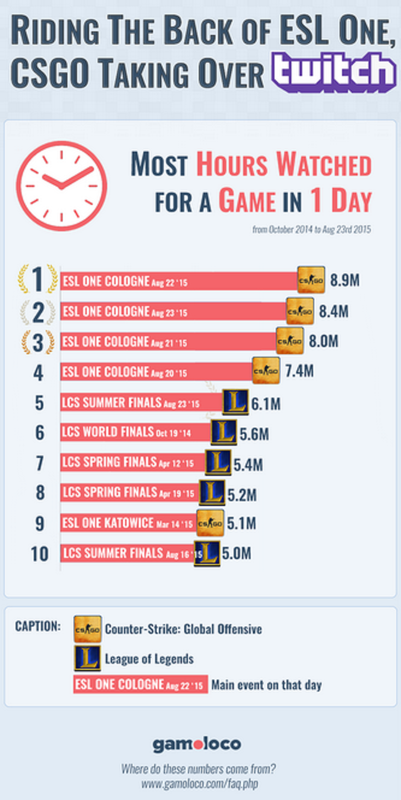 The infographic below displays the game itself rather than the specific ESL One Twitch channel, which is to say there were other streams being watched for CS:GO and League of Legends beyond just the official ESL One and LCS streams. By specific channels with each game, Gamoloco rates ESL One compiling 24.4 million hours (with another one million hours on the official “B Stream”) compared to Riot Games, developer of LoL, totaling just over five million hours over the past week. These numbers represent the English speaking channels only, with the Russian channel covering ESL One accumulating nearly three million hours, plus Polish and German broadcasts for each game. The crowds at both live venues were impressive as well, with the League of Legends NA Summer tournament filling up Madison Square Garden with a reported 11,000 fans. Europe was no slouch either as ESL looking as though the Lanxess Arena drew a fair crowd as the header image would indicate, along with a large crowd at the EU LCS at Stockholm’s Hovet Arena. While it’s hard to compare a single tournament to the long grind of a sports season, the NA Summer event pulled a crowd comparable to the NHL’s Florida Panthers and more than the MLS’ Chivas USA, though both the Panthers and Chiva rank last in attendance for their respective leagues. These impressive numbers aren’t even counting Dota 2’s yearly tournament, The International that was held from July 27 to August 8 to decide the world’s champion where we saw the single largest prize pool for an esports tournament. With the growing prize pool, interest level and time commitments being dedicated to esports — not to mention push notifications the ESPN app and score tickers (cap tip to HeyCJay from Reddit) and streams on ESPN 3 — it may be time to pick your favorite esports organization just the same as a football or baseball team.